For the last week, I have been seeing little flocks of mountain bluebirds zipping back and forth where the prairie meets the foothills. 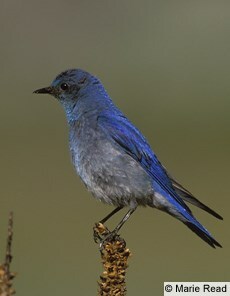 RIGHT: Mountain bluebird, Sialia currucoide, photo from Cornell Laboratory of Ornithology. These small groups often mix in my memory with the snow squalls of spring, which leads to a question. If they are primarily insect eaters, what are they eating now? Cornell's page says that they also eat small fruit, which around here would mean mainly juniper berries. The little flocks are mostly males—or at least the males show up better. Getting a jump on territory-claiming? But that would be summer feeding, wouldn't it? Via the Wildfire Today blog, a report from Oregon State University that the carbon emissions from forest fires have been over-estimated. Bill at Wildfire Today comments, "The new research does not go so far to say that 'wood smoke is good smoke', but they do use my new favorite word, 'pyrodiversity'." So when we light a fire in the wood stove, we are contributing to pyrodiversity. And, in all seriousness, the lodgepole pine forests of northern Colorado and southern Wyoming are pyrodiversity waiting to happen--not to mention other pine forests in British Columbia and Alberta. Other researchers continue to weigh the carbon-release issue. Politico interviews Michael Bune, new director of the Sierra Club. Brune made his name as executive director of the Rainforest Action Network — a scrappy corporate accountability group that stages headline-grabbing protests against major corporations that engage in logging, mountaintop coal mining and other practices that can be environmentally destructive. Bune approves of some of the Obama administration's environmental policies, but not surprisingly sees room for improvement. The administration has indeed done an excellent job in its first year promoting a wide range of environmental initiatives. At the same time, we also believe the administration hasn’t realized its full potential. It has made, specifically, clean energy a top priority and yet hasn’t really leaned into a whole series of initiatives that would make a bigger impact. The den of a black bear in Minnesota has a web cam. I am not advocating climate-change denial here. But how can we know what to think and what changes to make when the so-called people in charge are so sloppy and/or dishonest? Every incident like this just feeds the "ain't nothing happening" folks, industry sponsors and all. M. always insists on washing new clothes before wearing to remove any chemicals, sizing, or starches remaining from manufacture. And anything from Goodwill, ARC, or other thrift stores gets washed and aired on general principles and to get rid of the "thrift store smell." What that smell is I don't know, but they all have it. Apparently another good reason for washing new clothes is that they can carry quite a bacteria load. Last April I linked to an item about stray dogs in Moscow who commute to the city center. The phenomenon of "commuting dogs" has drawn increasing scientific study. Where did these animals come from? It’s a question Andrei Poyarkov, 56, a biologist specialising in wolves, has dedicated himself to answering. His research focuses on how different environments affect dogs’ behaviour and social organisation. About 30 years ago, he began studying Moscow’s stray dogs. Poyarkov contends that their appearance and behaviour have changed over the decades as they have continuously adapted to the changing face of Russia’s capital. Virtually all the city’s strays were born that way: dumping a pet dog on the streets of Moscow amounts to a near-certain death sentence. Poyarkov reckons fewer than 3 per cent survive. The headline says "make-up," but I suspect the paint was not to exaggerate beauty but to make the wearer look more scary, more divine, or more like something else. But how would we know, really? To the "things Fisher has eaten" category, add one bar of soap (hotel size). We wonder if he will start blowing bubbles in a rearward direction. Both alligators and birds move air through their lungs in one direction, unlike mammals' inhale-exhale cycle. It is a trait of their dinosaur ancestors. It is a more efficient way to breathe and explains why some birds are spotted flying vigorously at altitudes of more than 20,000 feet. Foresters say that the mountain pine beetle feeding frenzy in northern Colorado lodgepole pine may be ending. Still threatened: ponderosa pine, spruce. With all those standing dead trees, the potential for monster wildfires remains. In lieu of quail hunting, which ended on the 3rd, I took Fisher geocaching at Pueblo State Park today. His part in the process is to go for a cross-country walk, to be leashed when Spandex Insects are in the vicinity (since he is unused to them), and to whine piteously when the walk is interrupted by my turning in small circles and peering between large rocks and at fallen logs. As I quoted in "Gadgets in the Woods," some purer-than-thou types like Arizona writer Mary Sojourner recommend destroying geocaches. Me, I am all for anything that gets you out and about, rewards close observation ("Which rock is different from all the other rocks? "), and as the T-shirt says, "lets you use multi-million dollar satellites to find Tupperware in the woods." The typical parking-lot light pole at a shopping center or supermarket has a concrete base in which are embedded large bolts. The metal pole is attached to that base. Some models have a box of light sheet metal that covers the bolt ends and nuts. Normally it is held down with screws, but sometimes those screws are missing, permitting you to slide the box up the pole, exposing the top of the base. There is a fair amount of space in there in which objects up to the size of a sandwich might be secreted. Drop the cover back down, and no one is the wiser. I'm getting to the point that I can hardly pass one by without discretely wiggling that cover to see if it is attached or not. If you lift one and find a geocache within, please sign the log and return the container. If you find something else, be prudent. Horrible Web design, but an interesting summary on feral hogs. Feral hogs represent many unknowns to biologists, wildlife managers, landowners and hunters, and as one biologist so precisely put it, "feral hogs are an ecological black box." Fisher the Chesapeake ran off this afternoon while M. was walking the dogs. She brought Shelby the collie home, then went back after him. I woke up from a nap to find that she had even taken her Jeep up the Forest Service road looking for him. I drove around too. We walked the neighborhood and the forest edges, calling and blowing his "come" command on the whistle. Every dog on our road was riled up, but no Fisher. Probability one: He found something very good to eat. Probability two: He found a mountain lion. Sunset came. Shelby, meanwhile, curled up on her bed on the veranda with an attitude that said, "Not my problem. I'm the good dog." Four hours after he first ran off, he came back down the trail from the national forest boundary. He was very thirsty. He smelled of meat. He is a skinny dog, but now he had a paunch. But now it's dog-dinner time, and he is standing in the kitchen. He does not look completely at ease. I expect that we will be awakened tonight by dog-barfing. There went the whole afternoon when we should have been editing and proof-reading. But today, Fisher was an authentic dog. UPDATE, Jan. 13: Amazing—no barfing in the night. Last summer in "The Primeval Rain Forest, Not" I mentioned Michael Heckenger, the anthropologist interviewed by David Gann in The Lost City of Z: A Tale of Deadly Obsession in the Amazon. Heckenberger described finding traces on the ground of larger towns, field, causeways, and water-control structures used when the population of the area must have been larger. Now aerial photos are showing more and more what he meant. Note: It's a funny linguistic tic that we use "El Dorado" or "Eldorado" to mean a place, when in the original Spanish it meant a person: The Golden One, the fabled king of the fabled city somewhere off in the interior of South America. A fantastic amount of prehistoric rock art survives in Nevada because it lies within a Navy bombing range. The linked article offers other examples of the same. My favorite local example is Fort Carson, which has elk, wild turkeys, etc. Ironically, had not the Army requisitioned that land for training during Word War II, it would all be Colorado Springs subdivisions now. There is a word for people who cannot appreciate irony: fanatics. I am not a scuba diver, and I live a long way from the ocean, but I had to post this. How do you suppose he swings that polearm underwater? First, buy a chest freezer. Actually, when I saw the headline, I expected another article about people living in tunnels under the city. But the trio photographed looked far too stylish. It's ironic but true, as the article points out: in the city you can walk. In the country, "closer to nature," everything is too far away. UPDATE: These people might have the nearest thing to the Paleolithic Diet. Tuesday night at the public library down in Florence some of the local organic farming and CSA folks showed The Real Dirt on Farmer John as part of the library's film series. I liked it better than I thought I would at first. Listen up, team, here is what we know so far. 1. No bloodstains were seen on the lower sunflower-seed feeder on Monday, Jan. 4. 2. When the feeder's owner let his dogs out about 8 a.m. on Tuesday, Jan. 5, he reports there was a little "commotion." Unfortunately, he is a coffee addict and was busy preparing his morning fix, so we don't have a eyewitness account. 3. We'll need a lab report. 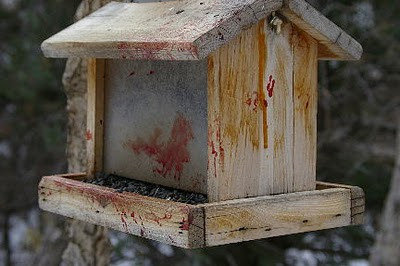 Bird blood or mammal blood? 4. One dog was located near the house about 8:45 a.m. and taken for a walk. The other was located about 9:15 a.m. at a neighboring house, chewing on a strip of elk hide. It's my gut feeling that the elk hide has nothing to do with our case, but check it anyway. 5. The feeder in question is about 15 yards from the house. When the owner's wife, a participant in Project Feeder Watch, scanned it with her binocular about 10:30 a.m., she saw the blood splashes. Further blood drops were reported on the snow under the feeder in a semi-circular pattern. 6. The reporting party says he found a Steller's jay breast feather about eight yards from the feeder that morning. Again, gut feeling, there may be no connection. Jays drop feathers all the time. Still, it might be something. 7. This is interesting. On Monday the 4th, a squirrel was electrocuted on power lines just a few yards from the feeder. The death was ruled a suicide, but maybe we should take another look at that one too. Maybe we have a serial killer stalking squirrels--if the lab report shows mammal blood, that is. Apparently this feeder is a favorite squirrel hangout. 8. All right, then. I want your preliminary reports in 24 hours.